Ramzan Kadyrov is looking for a new assistant on an Apprentice-style show. 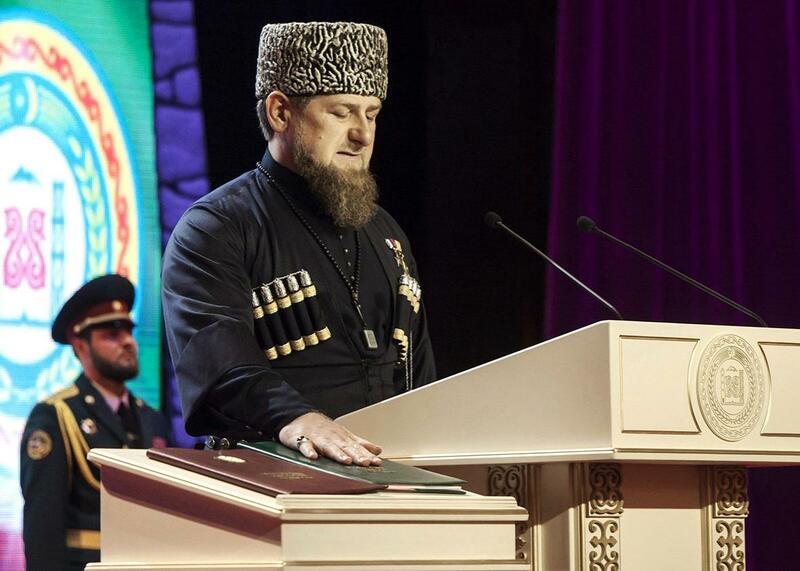 The strongman ruler of Chechnya is taking a cue from The Donald in his new reality show. Ramzan Kadyrov being sworn in as the head of Chechnya’s government at an inauguration ceremony. Donald Trump may have used his gig hosting The Apprentice as a stepping stone toward his bid to become president, but Ramzan Kadyrov, the head of Chechnya, a Russian republic in the Northern Caucasus, has done him one better: turning his own presidency into an Apprentice-style reality show. The Vladimir Putin–backed dictator, who is regularly accused of state-organized disappearances and torture, is already known for his publicity savvy with more than 2 million followers on Instagram. But he’s never done anything on quite this scale before. On the show, called Komanda or “The Team,” 16 candidates have been chosen from all corners of Russia and beyond to compete for a position as his new assistant. The first episode was broadcast by the state-owned channel Rossiya 1 on Kadyrov’s 40th birthday this month. The contestants had been forewarned to expect a rough ride. In the show’s trailer, Kadyrov hassled a TV presenter through a military obstacle course, bragging that only “the best of the best would become an aide to the republic. The show opens in Kadyrov’s ancestral village. Kadyrov meets, eats, and laughs with the contestants (mainly college-educated men in their mid-20s who work in management), who split into two teams. Then comes a challenge out of Personality Cult 101: Kadyrov allocates each group 3,000 Chechens to hold up colored signs in the stands of a football stadium spelling out their team name. In the end, one team succeeds with the task, while the other only manages to form Kadyrov’s initials. Kadyrov fires the leader of the losing team, who is consoled with being allowed to plant a tree in a garden dedicated to Kadyrov’s father, the late Chechen President Akhmad Kadyrov, who was assassinated in 2004. For Chechens, watching Kadyrov train members of the Chechen government on television is nothing new. Kadyrov presents himself as micromanager of the region, which entails regularly firing or scolding important officials in public, battering them for extortion, embezzlement or underperformance—even beating them up for an audience. In 2013, when Kadyrov noticed that that the ministry building in Grozny was in need of repair, he responded by inviting Minister for Sports Salambek Ismailov for a “boxing lesson.” Pictures of the match were published on Instagram. “Now erring officials will have to survive several rounds against the Head of Chechnya, who is a master of the sport of boxing,” one Russian paper reported. As with judo master Putin, hand-to-hand combat is a consistent theme in Kadyrov’s propaganda: He celebrated his re-inauguration earlier this month by having his three young sons (aged 10, 9 and 8) fight in a televised mixed martial arts tournament. But Kadyrov is now expanding his audience. Komanda is being broadcast nationwide on Russia’s state-run network Rossiya 1 rather than Chechnya’s local channel. This suggests that the show is intended to do more than just reinforce the Kadyrov personality cult down the throats of people who are forced to live under his rule every day. A rebranding is something that the Chechen warlord could definitely use following a string of violent excesses that have besmirched his reputation outside the Caucasus. These include being publicly accused of responsibility for the murder of opposition leader Boris Nemtsov in February 2015, and an attack by masked men on a minibus carrying journalists and human rights activists entering Chechnya in March. Perhaps most damaging, despite their close bond and mutual dependence, Putin appeared reluctant to endorse Kadyrov for a second term this spring. In addition to rebranding Kadyrov (and gesturing political goodwill), the show may also be something of an advertisement for Chechnya itself, a region still thought of by most Russians as a hotbed of radicalism and violence. The show is full of bird’s-eye shots of the snow-capped Caucasus Mountains and visions of the capital Grozny which, after being destroyed in the 1990s, now sports several skyscrapers. On the show, Kadyrov plays the gracious host. He is full of whimsical facts and fun jokes. He is even uncharacteristically modest. “The head of the republic is servant to the people. To serve the nation is happiness,” he explains somberly to the TV presenter at one point. And when the going gets tough in the elimination round, he is harsh but fair, “a true warrior,” as one contestant notes. The jovial boss broadcast nationwide on Komanda is certainly a different character than the darker figure Chechens regularly see on local television. In December 2015, a social worker named Aishat Inaeva recorded an appeal to Kadyrov on WhatsApp to complain about local officials’ extortion practices. “People are dying of hunger, but you don’t care,” she addressed the richest man in the Republic. Later that month, Inaeva appeared, looking shell-shocked, on Grozny TV to apologize to a smirking Kadyrov for her “lies,” keeping her head down as Kadyrov berated her. These televised public humiliations are the most unusual aspect of Chechen television, according to journalist Oliver Bullough. Given that Chechen society is relatively small and ethnically homogenous, “If you can put someone on live television and berate them in front of the whole country, it is a very powerful way to humiliate people. It’s something Kadyrov does a lot,” he says.